Théodore Duret [1837-1927], Paris; (his sale, 19 March 1894, no. 12); (Galerie Durand-Ruel, Paris); Antonin Proust, Paris; (M. Knoedler and Co., Paris); (César de Hauke, New York); Andrew W. Mellon, Pittsburgh and Washington, D.C.; gift 1930 to his daughter, Ailsa Mellon Bruce [1901-1969], New York; bequest 1970 to NGA. French Paintings of the Nineteenth Century from the Collection of Mrs. Mellon Bruce, California Palace of the Legion of Honor, San Francisco, 1961, no. 19, repro. French Paintings from the Collections of Mr. and Mrs. Paul Mellon and Mrs. Mellon Bruce, National Gallery of Art, Washington, 1966, no. 53, repro. 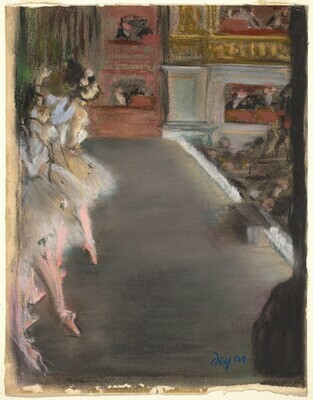 Degas: The Dancers, National Gallery of Art, Washington, 1984-1985, no. 7, repro. Impressionism: Pastels, Watercolors, Drawings. Albertina, Vienna, 2012 (not in catalogue). Degas's Little Dancer. National Gallery of Art, Washington, 2014-2015, brochure, fig. 2. Bodelsen, Merete. "Early Impressionist Sales 1874-94 in the light of some unpublished 'procès-verbaux'." The Burlington Magazine 110 (June 1968): 346. Russoli, F. and F. Minervino. L'Opera complete di Degas. Milan, 1970: 110, no. 501 (repr.). Clay, J. L'Impressionisme. Paris, 1971: 68 (repr. in color). Walker, John. National Gallery of Art, Washington. New York, 1975: 483, no. 716 (repr. in color). Small French Paintings from the Bequest of Ailsa Mellon Bruce. Exh. cat. National Gallery of Art, Washington, D.C., 1978: 26, repro. (continuing exhibition beginning in 1978). Lemoisne, Paul-André. Degas et son Oeuvre. 5 vols. New York, 1984: 2: 236, no. 432. Walker, John. National Gallery of Art, Washington. Rev. ed. New York, 1984: 478, no. 705, color repro. Kopper, Philip. America's National Gallery of Art: A Gift to the Nation. New York, 1991: 262, color repro. Wadley, Nicholas. Impressionist and Post-Impressionist Drawing. London, 1991: no. 12. DeVonyar, Jill and Richard Kendall. Degas and the Dance. Exh. cat. The Detroit [Michigan] Institute of Arts, The Philadelphia [Pennsylvania] Museum of Art. New York, 2002: 18, 101, pl. 8.